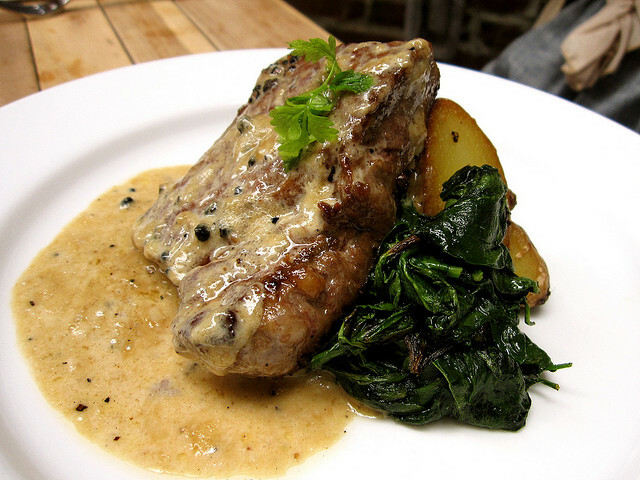 Steak au poivre or pepper steak is a French dish that consists of a steak, traditionally a filet mignon, coated with loosely cracked peppercorns and then cooked. The peppercorns form a crust on the steak when cooked and provide a pungent but complementary counterpoint to the rich flavor of the high-quality beef. The peppercorn crust itself is made by placing the steak in a bed of cracked black (or mixed) peppercorns. 1. Season the steak with salt and pepper. Meanwhile, heat the oil / butter in a pan on moderately high heat. 3. Place new oil in the pan and sweat the garlic and shallots then deglaze with the liquor and reduce to 25%. 4. Finally, add cream and season with salt and pepper then serve with the steak.